I always feel very sorry for people who would like to go sailing but feel they have difficulties due to seasickness. I don’t know if it is helpful, but a fact is that most people do get seasick. Yes, there is a very small portion of human beings who are lucky enough to have some abnormality in their vestibular system and don’t get sick. I actually do have guests from time to time, who actually don’t get seasick at all, no matter the sea state. I’ve tried my very best, even crossed the North Sea from Shetland to Norway with Christel, but she simply doesn’t get sea sick! 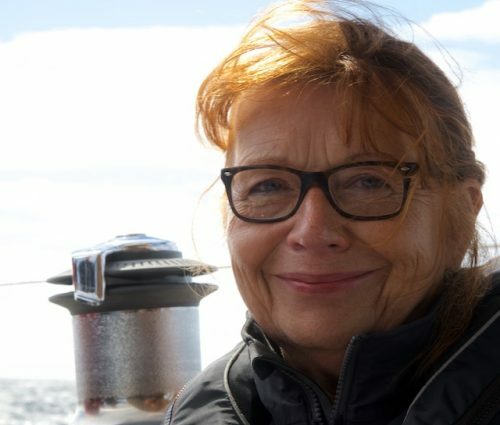 I will give it a last try, when she’s crossing the Bay of Biscay with me next year in September, but then I have to give in: Christel is among the few lucky ones who simply don’t get sea sick. Photo taken on the North Sea in heavy swell from behind. These rare lucky ones aside, if someone tells me he or she “doesn’t get sea sick” I think to myself: “You haven’t been out there in real bad weather long enough, yet…”. A lot of guests claim they got seasick for the first times in their lives onboard Regina Laska, which says less about the boat than their previous experience and the Reginasailing leg they chose to join. There are sail training legs for everyone on Regina Laska, from the protected waters of the archipelago to ocean crossings. 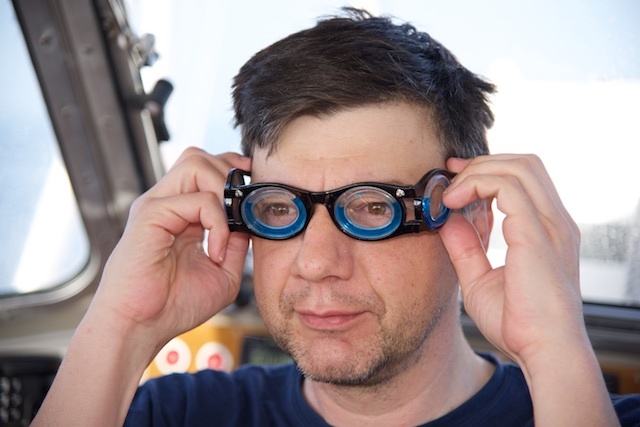 Obviously, if you join onboard for an offshore training leg, have not been on a rocking boat for weeks or months and begin your stay onboard with a nice night in the pub… well, seasickness is almost pre-programmed. During some harsh crossings I constantly empty buckets, which is part of my job and nothing to be ashamed of. 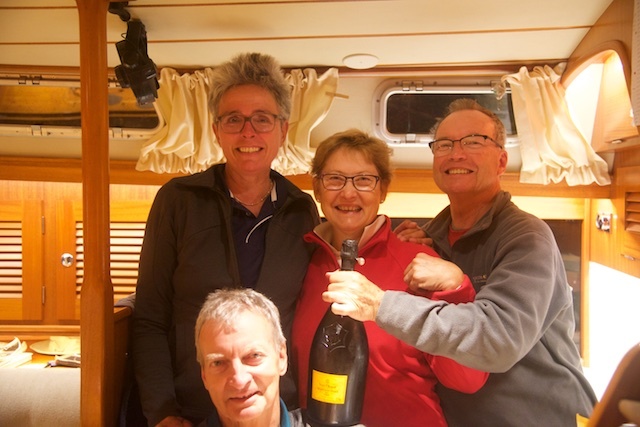 Celebrating the arrival in the UK with a great bottle of Champagne after having crossed the Bay of Biscay. It’s better to end a crossing than beginning it with alcohol. Meaning: Don’t drink the night before you set to sea! Avoiding heavy weather is an obvious way to reduce seasickness so don’t underestimate good passage planning and weather knowledge! Who wouldn’t get seasick under such conditions. Photo taken while motoring the Elbe from Brunsbüttel to Cuxhaven. So back to the consolation, namely the fact that most people do get seasick and still go sailing. How do they do? 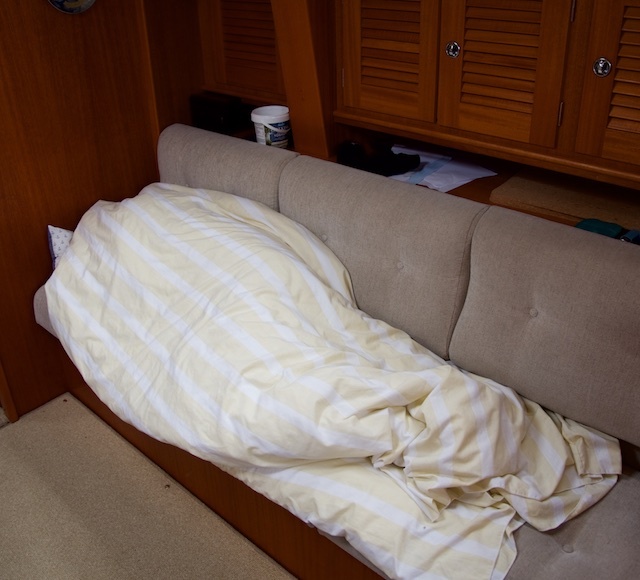 Many of my guests get seasick each time, and yet, they keep coming back year after year…. Maybe interesting to know, a small baby does not get seasick at all! Then, the risk of feeling of seasick slowly increases and has a maximum around 12 years of age and then sickness slowly decreases again. 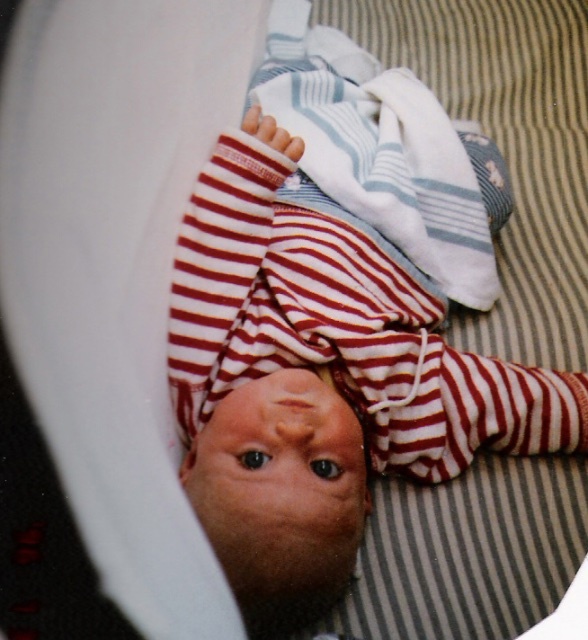 My own son Jonathan just a couple of months old lying in the sea bunk during a choppy Baltic crossing on our HR29 “Datsy”. No sea sickness in his age! So, if you wait long enough to go sailing, you might suffer less, but then again, is it really worth waiting until you are an old sea dog to go sailing? The ideal age for ocean sailing? Is waiting for the right age really the best option? In any case, age must not stop you to go sailing. The oldest blue-water sailor I have met was a gentleman I met in Porto Santo/Madeira. He was 94 and had a very young wife (she was in her 80’s). He was on his fourth circumnavigation! No, don’t wait too long and get started now! The age you have today is the perfect age for you! Shall sea sickness prevent us from sailing? No, I would not get put off due to seasickness! 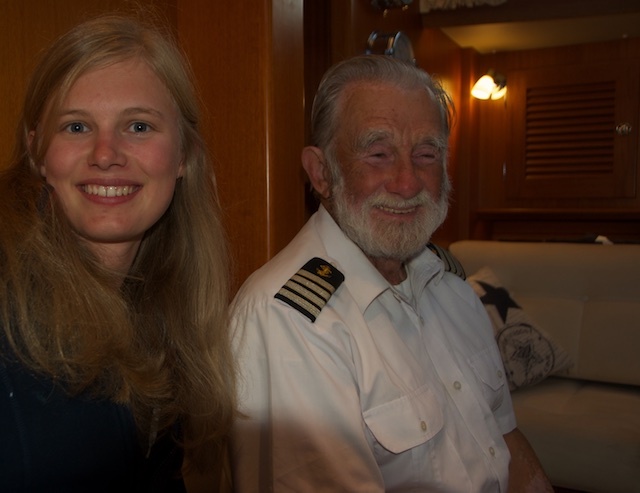 Captain Baranski with my daughter Jessica onboard Regina Laska. 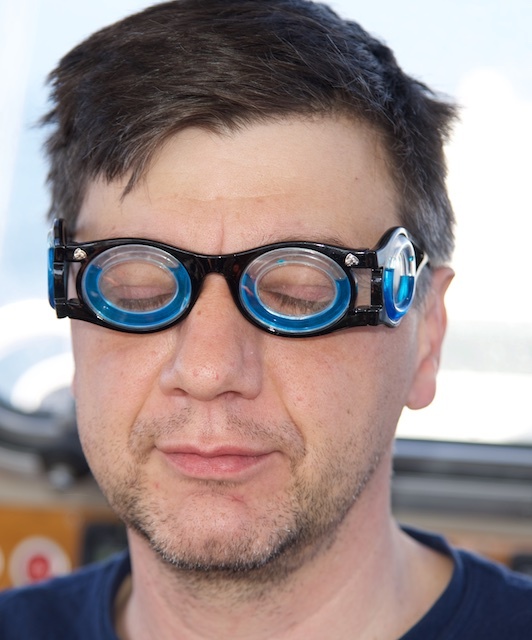 Seasickness is a nasty “disease” that (nearly) everybody suffers from. It’s just to accept it as part of sailing and learn to cope with it. Like the fact that skiing is cold, swimming is wet and if you do sports you get sweaty. The difference between experienced and not so experienced sailors is that the former have learnt how to cope with seasickness. They sometimes can avoid it all together, since they have learnt to read their bodies and take counter-measurements before it even gets started. Once you feel sick, it’s almost too late and so much more difficult to cope with it, than acting before it takes you by surprise. The other good news is that the absolute majority of people (well over 80%) get rid of their seasickness by experience and being used to the boat’s movements. After 3 days and nights at sea most people get used to the movements. So here, Captain Baranski was right after all. But, hand at heart, who is at sea for this long without getting ashore? Joining on a Reginasailing offshore leg can give you this very experience to find out for yourself, while not having to take your own responsibility as a skipper. 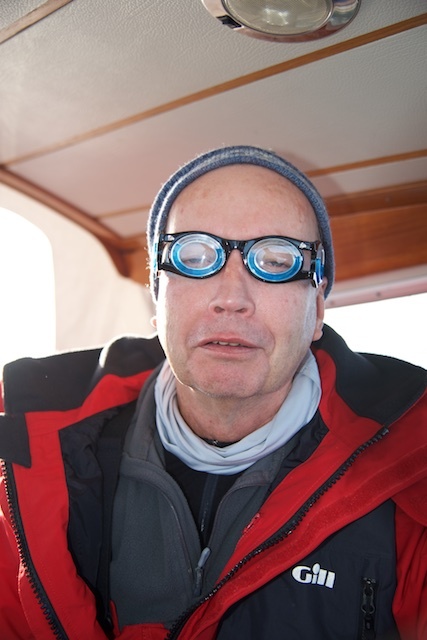 Christian is heavily affected by seasickness, unfortunately, and nothing seems to help. Yet, he keeps returning on Regina Laska. He knows, it’s just a question of time until it disappears. Christian has learnt that during the first two to three days, he’s feeling really bad! But on the third day, he can even read under deck, as you can see above. 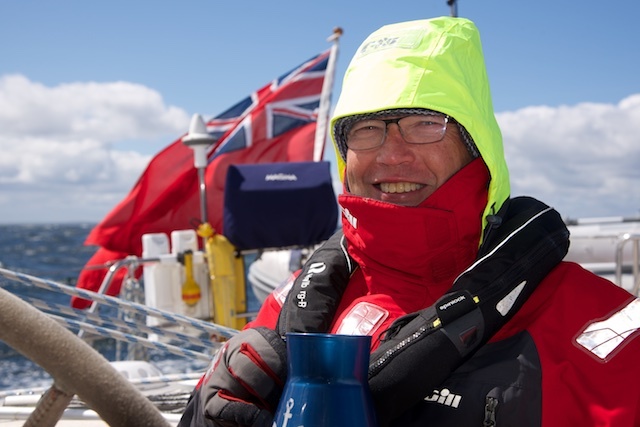 Photo taken during the third day during our four days crossing from Inverness nonstop to Norway. Me, too, I get seasick and so I start my season very carefully. 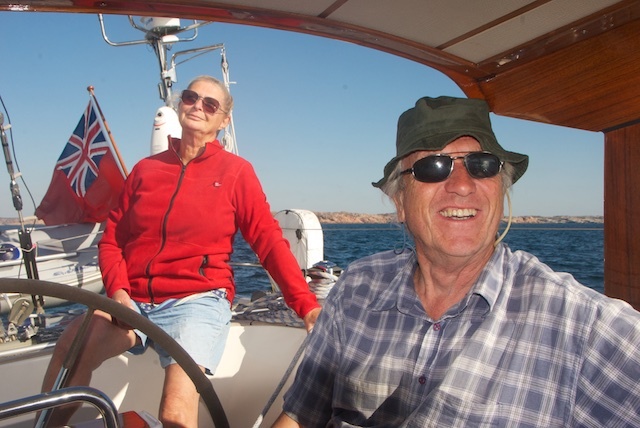 I sail in sheltered waters during nice weather and begin the season in the archipelago and build up my “sea legs” slowly and then I can cope with more and more sea! Some years, I avoid sea sickness all together! An early season leg in spring with no waves makes a good start to slowly getting used to the movements. 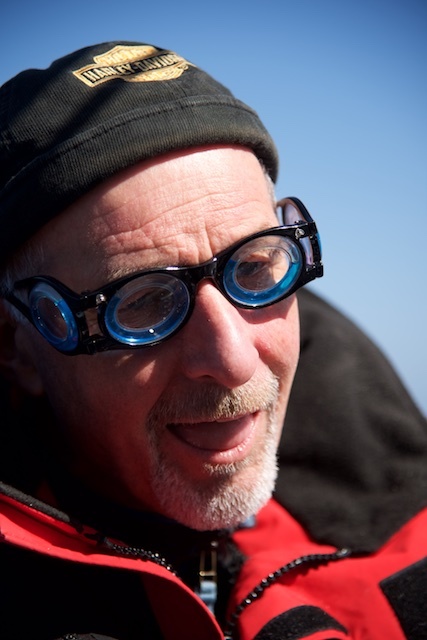 One of the major players in seasickness is psychology. 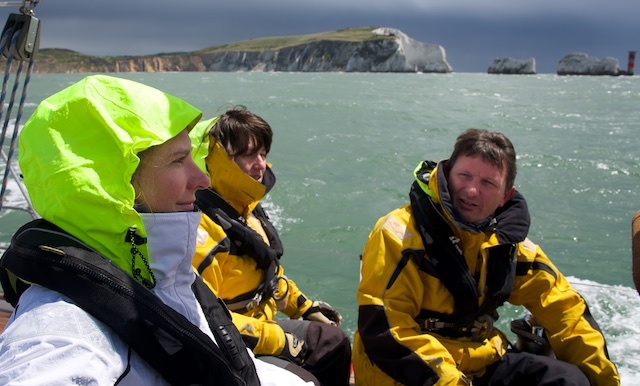 Feeling cold, wet, hungry, tired, anxious and not having your situation under control quickly triggers seasickness. My guests are therefore strongly advised to bring good clothes and foul-weather gear for the cold climate, keeping them warm and dry. 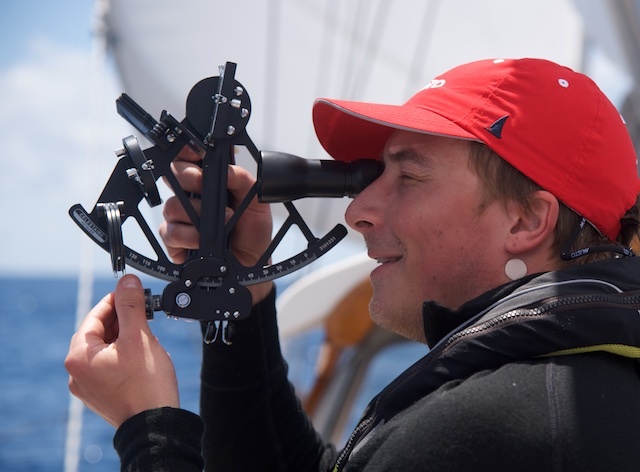 Further, they are encouraged to take an active part of sailing, taking watches, standing by the helm, navigating and enhancing your sailing skills. Good atmosphere and having fun together makes the rest. 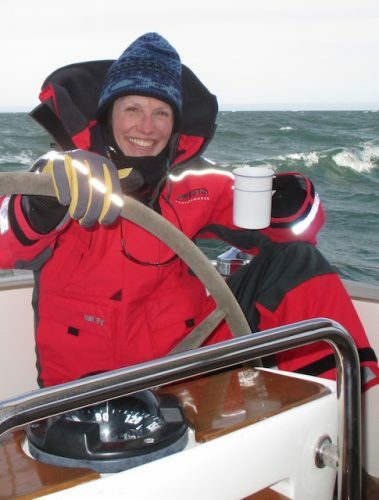 Feeling good: Good clothes, confidence in boat and crew and a hot cup of coffee, despite following seas! Seasickness? I left that behind! 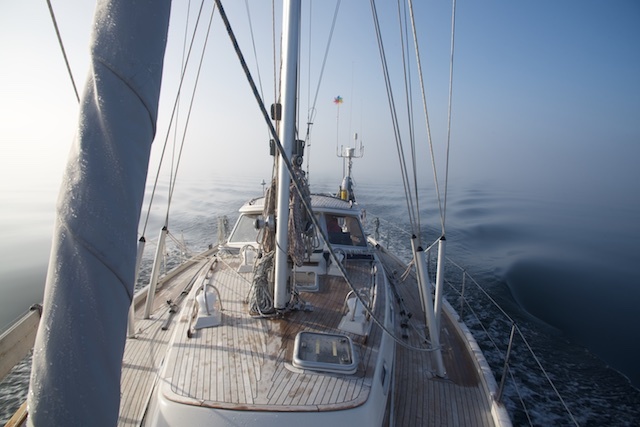 Anxiety is also something relative: For an experienced sailor, some 2m waves on the open sea feels just good, despite the possible rain, while for an inexperienced sailor, not seeing land under the same misty condition can be daunting. The saying “The most dangerous thing at sea is land!” can be a misplaced statement at this point, no matter how true this saying is. The skipper needs to plan and sail according to the least experienced sailor. Goal number one onboard should be: Nobody must feel anxiety! Even on flat seas, it can feel overwhelming to be on a rocking boat. It is important to give each crew member a meaningful responsibility. Steering while looking at the horizon helps far more against sea sickness than one might anticipate. Another important issue is the crew’s confidence in the skipper. This is something the skipper must earn and cannot ask for. 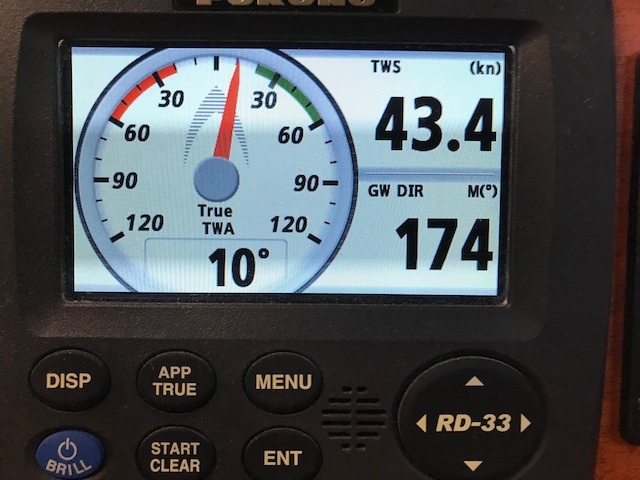 When the crew experiences waves being high as the sky, the boat is rocking around like wild, the rain pours down, you can’t see anything but the sea around you and all you hear is the roaring wind in the rig mixed with a sudden “small-craft-warning” out of the VHF can simply be too much! Here it’s really important that the crew feels confident in the ability in the skipper. The experienced sailor need to act calmly and give the feeling that “everything is all right”! (while you might be wondering to yourself what that strange noise from the engine room is all about…). 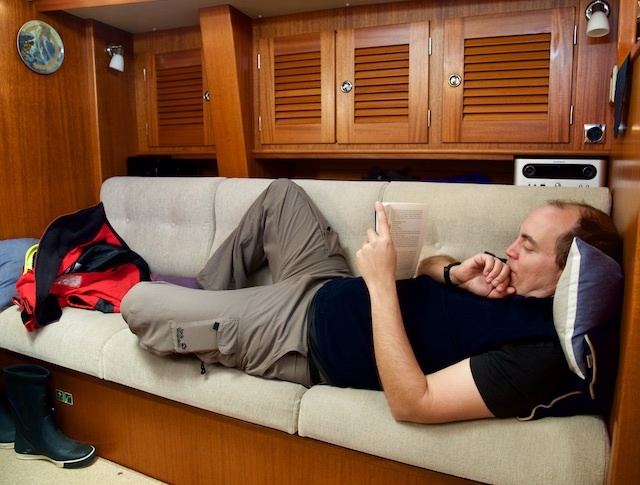 Talking sea sickness, it actually helps being the skipper. You get much less seasick as the (active) skipper in command, compared to being a (passive) crew member, especially if there is lack of confidence in the skipper’s ability! So: Get active on board! Feeling confident and being active is key to avoid seasickness. How to build confidence and become a trusted skipper takes years and cannot be taught in a short sailing course. As a skipper, it’s not easy to have eyes like a radar, not to speak about having everything under control. And even if you haven’t, it’s helpful to give impression that everything is “fine”, nevertheless. It goes without saying that this needs to felt by the crew and not only believed. Not easy, to tell the truth! 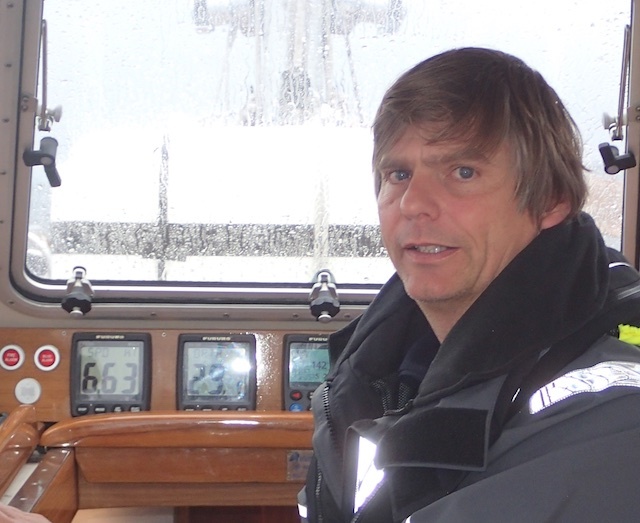 My friend Tom Cunliffe puts it like this: “Seamanship is when everything seems so easy”. I can’t agree more and love this definition of seamanship! A good way to avoid seasickness is not to sail over your own limits. Sailing in fine weather under ideal conditions will help you to build experience and avoid sea sickness. Slowly building confidence under ideal conditions helps building trust and avoids sea sickness. The first ever night sail is best done under ideal conditions. Your boat will take care of you! Discussing the impact of wind and waves often helps to increase trust in the fact that Regina Laska will take well care of us! She’s a good, strong, safe and proven boat! 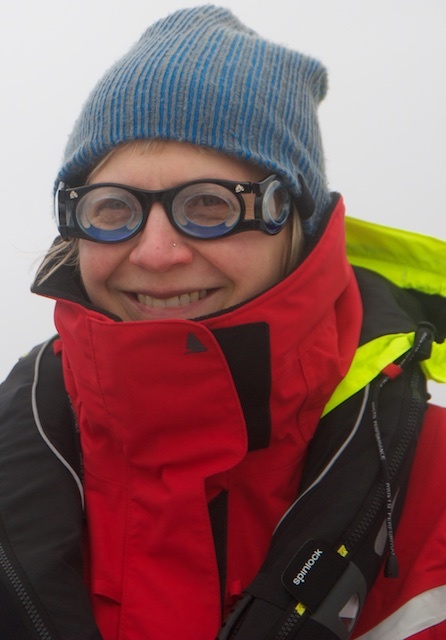 HR46’s having sailed million of miles from Svalbard to Antarctica on all longitudes and latitudes of this world. If we can’t take care of the boat, this fine Hallberg-Rassy will take care of us! If you know the boat will take care of you, it can help feeling secure and thus less prone to seasickness. There is nothing more wonderful than to sail in a seaworthy boat built for the ocean waves. Choosing your boat and equipping her with safety and comfort in mind is just as important as trusting the skipper. Multi-hulls, for instance, do not heel but they have a very strange movement in the sea with high acceleration forces. This means that multi-hulls don’t roll in the sea, and instead move abruptly from one side to the other, with one pontoon sailing on one wave and the other on another wave, giving a very strange form of movement for some. 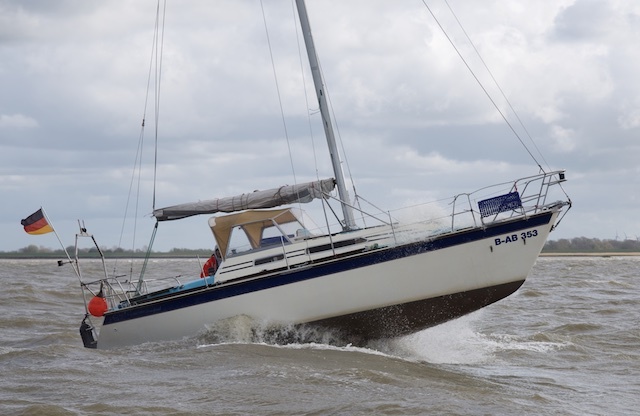 Try sailing a multi-hull in heavy seas before buying one and see how you like the movement. Some prefer it, some don’t. Further, modern designs with flat bottom hulls also give a totally different move on the seas, while traditional hulls with deep V-shaped hulls sail more through the waves. Longer keels sail more steadily and less nerviously than boats with a shorter keel, which more “fly” over the waves. There is an interesting video from German yachting magazine YACHT comparing the various hull types, albeit only in German, unfortunately. 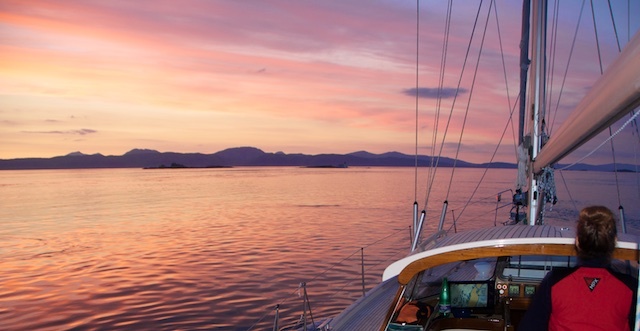 The movement of your boat can have a huge impact on how you feel onboard. What to do “out there”? 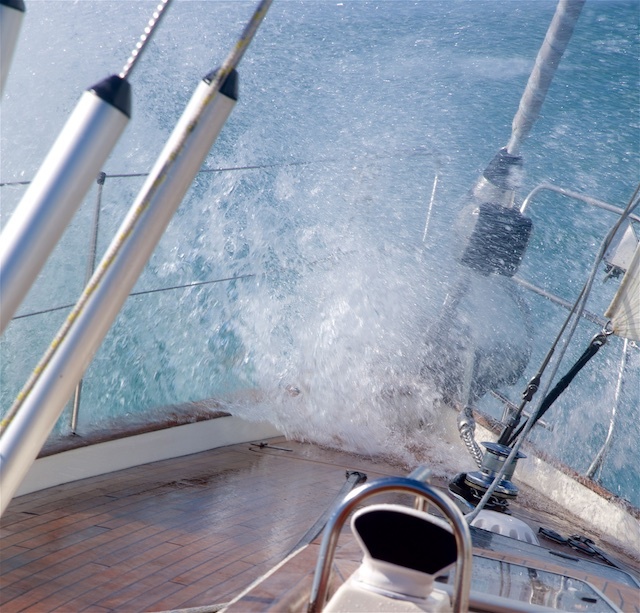 Once sailing, there are some rules that can help you to avoid seasickness. Some of these are very personal and you should try to get to know your body and learn what you should avoid. Avoid time under deck. If you need to go to the bathroom, take off your foul weather gear already in the cockpit (a good sprayhood or even better a hardtop is worth gold under such circumstances!). Rig your sea berth / lee cloth early. 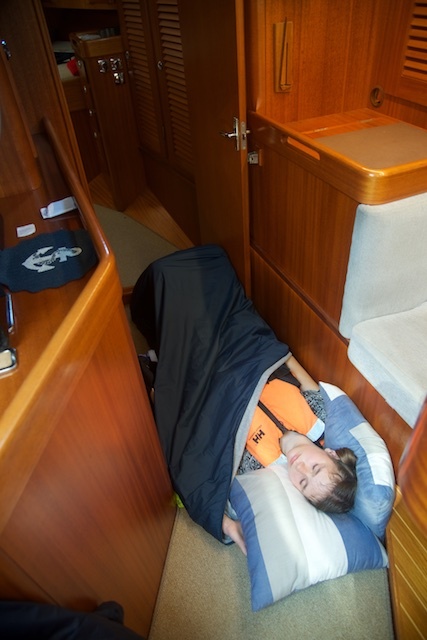 Sleeping on the floor, especially in the walk-through in a centre-cockpit boat, is often the best place to spend your time when resting. 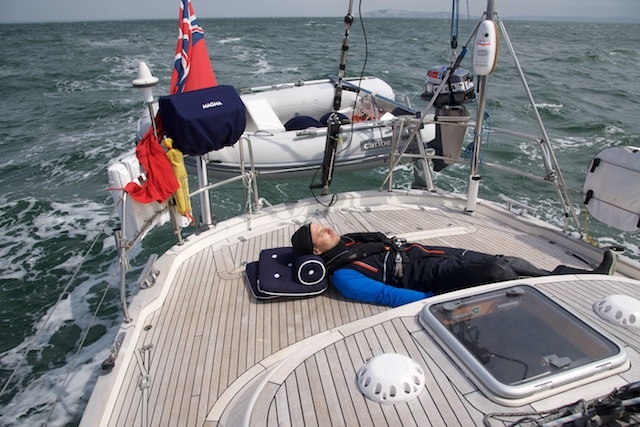 Lying down with your eyes closed in the fresh air might help, but often you feel so cold when seasick, that the best (and safest) place to rest is under deck. 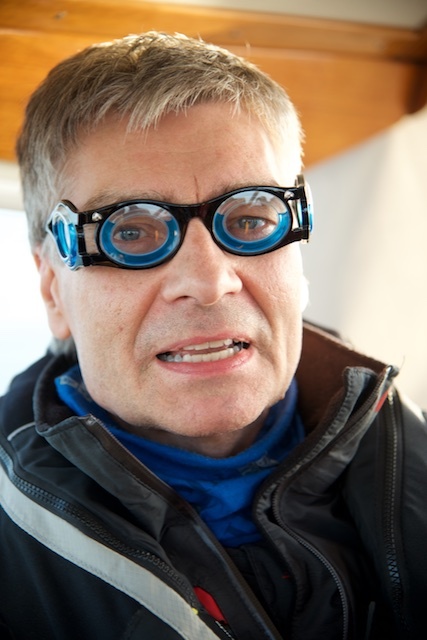 Sometimes it is unavoidable to get seasickness despite all above measurements. Dehydration is a big issue when being seasick, so one needs to drink regularly, en small sips help as long as it is done constantly. The body cannot cope with many days of sea sickness without drinking, so dehydration is a major and often underestimated risk. For eating: crackers with little taste are good. Some say banana tastes good both ways and are nice and slippery, despite superstitious seamen were not suppose to take bananas onboard a ship. Important: There is nothing to be ashamed of and vomiting often gives a feeling of relief and you will feel much better thereafter. When vomiting, never do this overboard, but in the dedicated bucket (or in the head). When feeling better after the vomiting, you can safely pour the content overboard (on the leeward side! ), always hooked on by means of a harness or – much better – empty the bucket in the toilet. On Regina Laska it’s my job as the skipper to empty all buckets so my guests can avoid going down below or risk falling overboard when emptying the bucket. Going to bed with your bucket is a good idea. The bucket gives you the feeling of that if you need to vomit, you can do it here and there straight away. On Regina Laska I have a number of handy plastic buckets including lids that originally was used for Greek yoghourt. My children still call it “vomitting yogourt” and got used to me buying large quantities of this type of yoghourt during winters to re-use the buckets onboard later in the year. Papa Greco is never far away…! 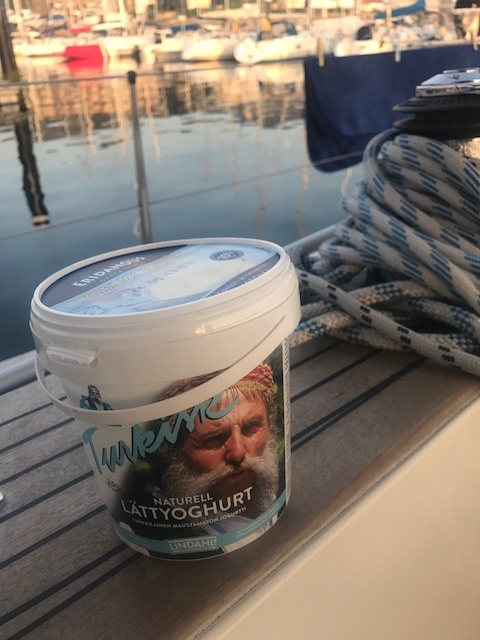 Today, these buckets are called “Papa Greco”, so named by one of my humorous Italian sailing guests, always staring at this old Greek man on the bucket wherever she went under deck! Funny Swedes call my bucket instead “Pappa Kräko”, since kräk means vomit in Swedish! Haha! Pappa Greco, here in its Turkish version. There is really nothing to be ashamed of and I see my job as the bucket emptier, sometimes juggle around with several buckets simultaneously, handing water, paper towels and fresh buckets while emptying the full ones in the toilet. I see nothing wrong with that and just feel sorry for my guests. Never sleep far away from your bucket! 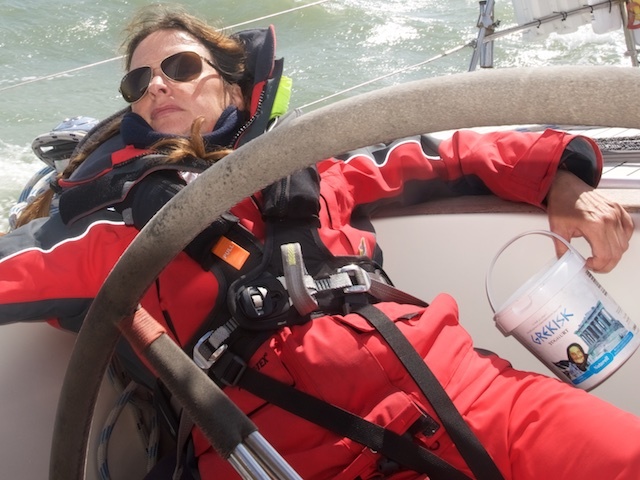 Here, seasickness has almost gone, as you can see from the fact that the bucket is resting on the shelf by its own. I haven’t had a guest, yet, for whom the seasickness didn’t disappear on the third day the latest. Please note that not all sail training legs onboard Regina Laska are miserable and full of filled buckets! Most legs take place in pleasant sheltered waters where everyone feels wonderful during the entire week. But as soon as we head offshore, feeling queasy does very quickly become an issue. And here, one thing has completely changed my life onboard namely Anti-Seasickness drugs. The number of buckets to empty have fallen significantly since my guests take sea sickness seriously and go to their doctors before boarding to talk about seasickness medication! Some of these make wonders! There are a lot of drugs on the market and most of them are antihistamines, such as Stugeron. There are loads of brands, all of which contain antihistamines. Another, more natural way of lowering your level of histamine is vitamin C, but you need to start early and take big quantities to get the same effect as antihistamine drugs. 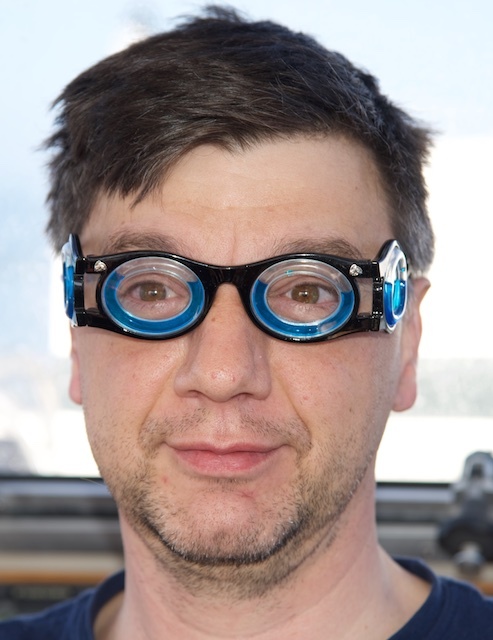 You need to try out what works for you, ranging from C-vitamin via acupuncture wrist bands to glasses with a blue liquid inside, giving you a vision of a steady horizon. If you feel a bit queasy, a good chewing gum is called Superpep (bought over the counter in Germany) with the ingredient Dimenhydrinat. While chewing, it can help to get rid of that nauseous feeling. If your sea sickness is not too bad, this helps a lot to feel better. 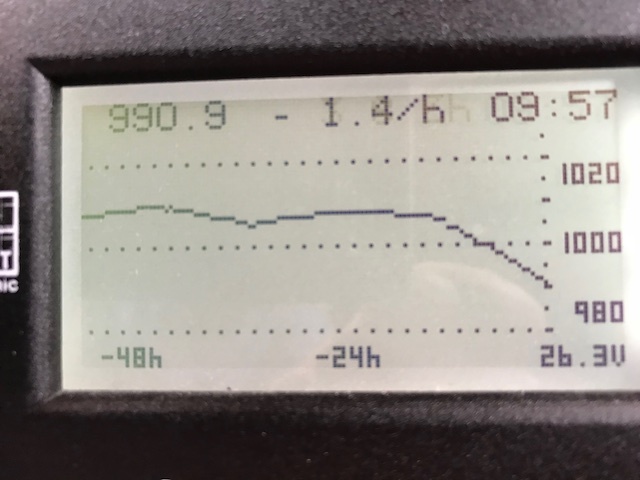 My own personal experience with countless guests having since been more or less cured from seasickness points towards Scopoderm. Although it does not eliminate seasickness completely for all, it does help so many of my guests and so many have completely been relieved from seasickness! I just can’t refrain from highlighting the positive effects it has had on my guests (and myself as bucket-emptier). 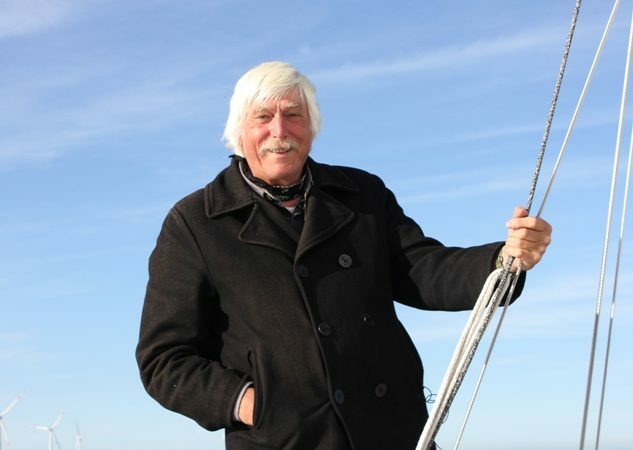 Ross from Australia has been offshore sail racing all his life. 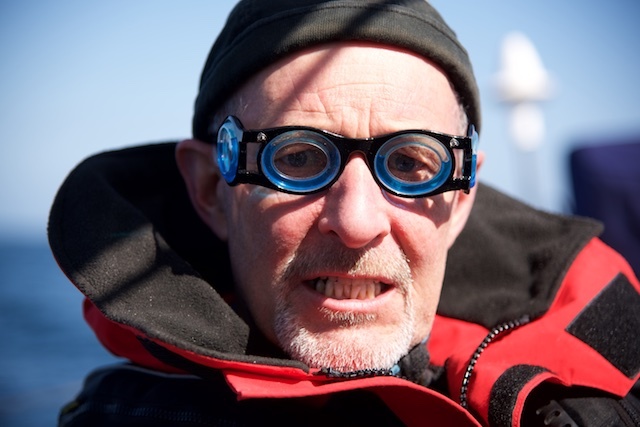 For decades, he just accepted that during the first two days he felt miserably due to seasickness. Not until he tried Scopoderm on Regina Laska his life changed. Had he just known before…! 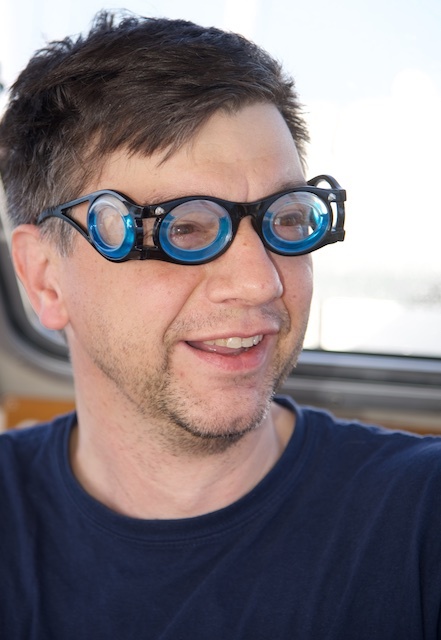 Ross is now completely cured from seasickness, but he says while it took 2 days to get his sea legs before, with Scopoderm it takes some days longer and he has a dry mouth during these first couple of days with Scopoderm. But it is all so much better than vomitting for 2 days! 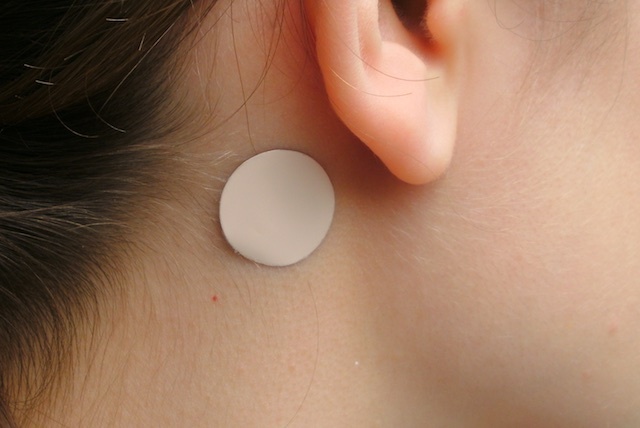 Having discovered the “plaster behind the ear” has changed life for many of my guests, including my own family. 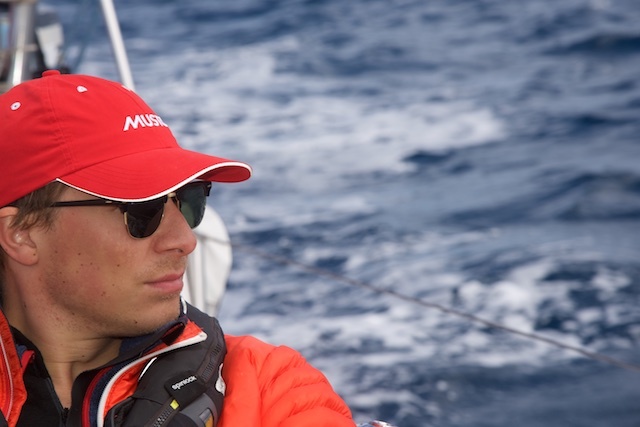 If you zoom in on photos of many offshore racing boats, especially in the beginning of an ocean leg, you will notice that many of them wear their “patch” behind their ears. “Do you wear your patch” has become synonymous with “are your ready to cast off?”. Just beware, it needs to be put on at least 6 hours before the sail, i.e. the night before. Do try it ashore first and don’t do the same mistake as I did when I tested it ashore: It says “place the paster behind your ear”. Well – , I thought, I have two ears, don’t I?! So I placed one plaster behind each ear, giving double dose. You bet, I got a dry mouth (which is one of the more common side effects actually used in medicine for patients with water in their lungs). If you put it behind the ear it lasts for 3 days. Most people have got their sea legs by then, if the sea is not all calm. And if it is calm, just put on another plaster for the following 3 days. But most often, after 3 or 6 days (i.e. after one or two plasters) you are fine and don’t need one any longer and are cured from seasickness until you get ashore for 2 weeks or more again. Unfortunately, 2 weeks ashore will start the entire process again! Feeling well offshore when wearing the patch behind the ear. Please note that Scopoderm is not available in all countries, just like some antihistamines are not available everywhere. The very effective antihistamine Stugeron, for instance, is available over the counter without prescription in Switzerland, while not available in many other countries. And then again, the very efficient Scopoderm is available in many countries (by prescription), while it is not available in Switzerland! So it’s worth asking in your neighbouring country as well, talk to several doctors and decide for yourself and try it out to check the side effects. 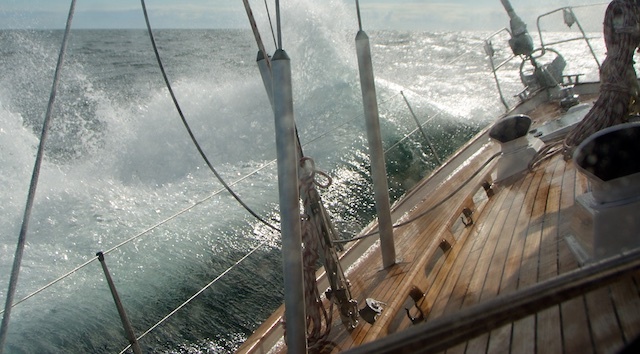 Very often, you get a dry mouth from it, but this is so much better than getting seasick! Your vision can also go down and you can’t focus as well, but again, this goes away rather quickly when you take off the plaster. It then also has some more significant possible side effects, such as hallucinations, and that’s why it is important to check it out before together with your GP. The good thing is that this drug is so proven and has been around for 50 years (used in the chemotherapy of cancer patients who feel dizzy and sick) that I dare to suggest that you talk to your doctor about it. It is good for children over 10 years of age. Important: What I write above are my personal experiences with guests and cannot be taken as scientific. I am no doctor, I may not reach any prescription drugs and you must talk to your GP before trying out anything for yourself! Onboard Regina Laska, you have the chance to discuss many topics and try out various weather conditions and feel safe and confident while approaching the edge of your comfort zone, but always avoiding too much stress. Therefore, I take a lot of effort to place each individual guest on a most suitable sailing leg. 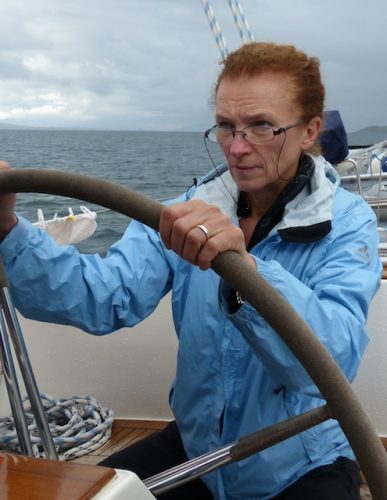 Regina Laska rounding Sumburgh Race south of Shetland, a perfect possibility to experience heavy waves during a limited period of time under controlled condition. Send me an e-mail to apply to join on a leg that fits you and your wishes! Welcome onboard.